I could not let January pass without commenting, once again, on the cold. This being the last day of the month, there is a reasonable expectation that the temperature will climb above freezing for the first time in over a week. Yes, it has been that cold. 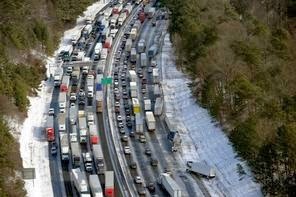 Even so, our region has been lucky compared to places like Atlanta where the ice storms closed the major arteries three days ago and they were still not open as of yesterday. It is a crisis of immense proportions. School children spent in excess of ten hours trapped in school busses. Cars ran out of gas while idling in the blocked roadways. Motorists sat for 12 hours in their cars trying to keep warm. It is bad here, too. 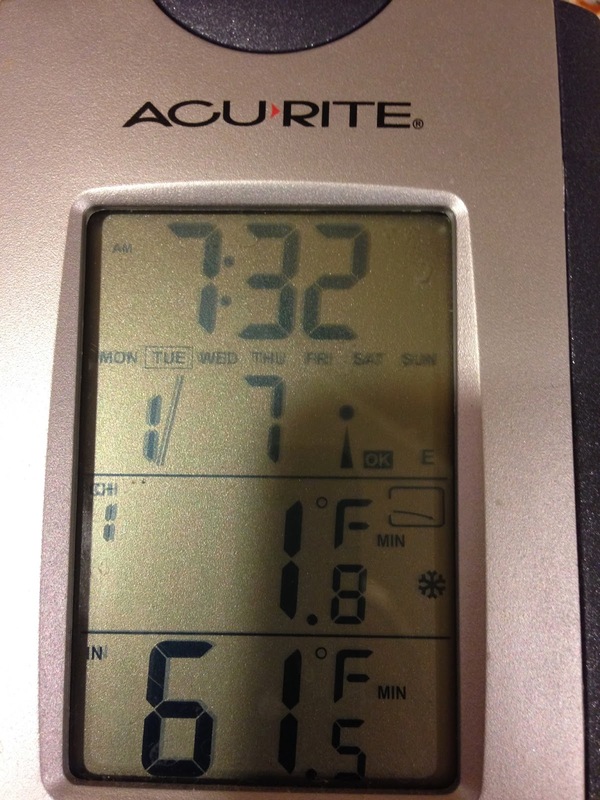 Yesterday morning it was 5.5 degrees when I woke up and headed off for my racquetball match at the gym. Chris later reported a 4 degree temperature just before dawn. People are suffering because of the cold. I know that by comparison, 4 degrees is warm compared with some locales. But it still is cold and the temperature does not account for wind chill. Maybe winter will end soon! Not soon enough. Although the leaves are gone and the harvest is long complete and it appears quiet with little activity, the vineyards of Virginia are busy places during the winter. Although it may not look like it, this vineyard is being pruned in preparation for the coming growing season. The piles of wood, as it is called, on the ground are the evidence of the activity that continues even with snow on the ground. Chris took this picture during our Charlottesville wine weekend. The white snow provided contrast against the dark mountains in the background. And the vines, the stars of the show, are shown just after the pruning that prepares them for the growing season ahead. Although there isn't a lot of growing going on, vineyards are busy places during the winter. Consensus Blending at Keswick Vineyards near Charlottesville, Virginia, is an awesome way to spend a day. I have written about the Consensus blending before--an event sponsored by the vineyard that brings the wine club members together to blend a winning wine that the winery will bottle and sell. Our team was ready for the challenge of taking four wines with defects and making a good tasting wine that people would buy. It was tough. We were presented with four wines: Touriga, Norton, Syrah, and Chambourcin; all grown on the estate and ready to be blended into a great wine. Blending a winning wine takes a lot of patience, the ability to find ways to blend imperfect wines into a masterpiece, and a lot of luck. There is science involved, but as the winemakers says every year, we are being asked to do in two and a half hours what takes him six months to achieve. And we do fairly well. This year we had a lot of fun, enjoyed some really imperfect wines, and blended what we thought was a great wine (until we tasted it later) all while spending another awesome weekend in Charlottesville. Our wine did not do as well as we had hoped, but when we tasted it later during the blind judging portion of the day, I felt that it got what it deserved. I rated for the winning wine very high and it was a very nice blend. Our wine, was mediocre by comparison and we rated it as such. Although we felt bad that our blend didn't do well this year--we learned a lot and I know that I am already looking forward to next year's event. I risked life and limb again last week by flying to and from Denver in the not so friendly skies. Not that it was bad, or that I had any irrational fear about the airline upon which I was flying. No, my concern was for the other passengers doing something stupid. 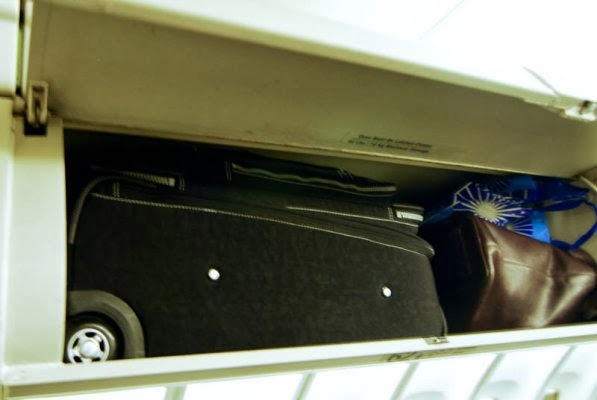 I believe that the most dangerous part of any flight is the boarding and deplaning process when bags are being slung into and out of the overhead bins. I fear that the too heavy bags are are going to go out of control and give someone a concussion. And, it seems, that the most frail people have the heaviest bags. There ought to be a big sign before boarding--if you can't lift your bag above your head--check it! That written, I had a new boarding experience. 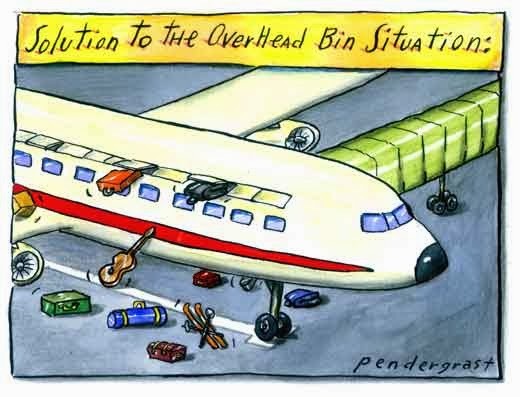 Almost everyone knows that the overhead bins are the most sought after space on an airplane--especially in the winter with bulky clothes and coats. On my return flight, I found an nice empty row, yes, I was flying Southwest so I was empowered to choose my seat upon boarding, with corresponding space above for my relatively small bag. I moved a backpack which was taking up an inordinately large amount of space and installed my bag in the bin. Almost immediately I was confronted by a woman who informed me that she was saving that space for her husband's bag which had to go in sideways in order to fit. I had a choice to make which would set the tone of the trip for the next four hours. I could tell her how I felt about the oversize bag and that it should be checked because it was too big and that it was poor form to save space. Or, I could go find another seat. Not wanting to upset someone who I was going to have to share fairly close proximity with for the trip, I chose the other seat since I was an "A" group boarder and still had options remaining. How did I really feel? I wish the airline would enforce the bag size standard and not let people get away with using more overhead bin space than they are allotted. I wanted to tell her that the bag should have been checked--it is after all Southwest, they check two bags per traveler for free! But I didn't. I found another seat, stowed my properly sized bag in the still empty overhead bin and slept for most of the flight home never having to confront the woman or her husband about what my "inside" voice was itching to say. I remember my Air Force days when passengers were considered self loading cargo. I wish we could have left that cargo on the ramp. 1. 27 days into the new year and I continue to wonder why the year is passing at what seems like light speed. 2. There is something very unsettling when the lead story on the national news is about a shooting at the mall where I shop. 3. The frigid weather is continuing. No end is in sight and unless I can find a way to get a trip to someplace warm--like the Caribbean, I will have to continue to deal with it. 4. I figured out that there are 90 days until pool opening weekend--provided the freezing weather ever goes away. 5. I think the stock market is beginning to follow the temperature. 6. Wine weekends are a great way to get away and engage in something that Chris and I both enjoy doing--especially with friends. 7. We participated in our fifth Keswick Vineyards Consensus blending weekend yesterday. We had a great time even though our wine was not selected as the Consensus champion. I learn more and more about wines and taste by participating in this event. 8. Tomorrow is a sobering day as we remember the Challenger disaster which occurred 28 years ago on January 28, 1986. 9. Ground Hog Day and Super Bowl Sunday are the same day this year. I wonder if the ground hog will see its shadow and if that means the Denver will win the game. Is there any way to make these two items somehow related? Saturday was devoted to friends and wine exploration. Although we planned to visit five or six wineries, only four were visited. And that is really OK, we had fun. During the day we revisited King Family Vineyards, Pollak Vineyards, Pippin Hill Farm Vineyard; and made our first visit to DelFosse Winery. We began the day at DelFosse Winery and found a scenic setting well off the beaten path. The setting was particularly bucolic and the tasting room was very nice. The wines were solid and provided a good representation of the winemakers efforts. While the wines were good, we did not find them exceptional. For our second stop, we turned into Pippin Hill Farm Vineyard just off US 29. We had visited this vineyard about two years ago shortly after they had opened their impressive tasting room. The view from the tasting room is impressive and the food looks very tasty. The highlight of the tasting here was the two examples of sparkling wine that are offered. Both were solid sparkling wines and the Rose was the highlight of the visit. We found the other wines, both reds and whits, to be good, but again not exceptional. from season to season. Two years ago we found the wines to be unremarkable. Yesterday, however, the wines were definitely the highlight of the day. The tasting room remains beautiful, but it is too small--and we had to wait about 15 minutes to be able to be served. It was worth the wait. We found exceptional whites, the 2011 Chardonnay and 2012 Vigionier were great; but the 2012 Pinot Gris was truly exceptional. For the reds, we enjoyed an exceptional 2010 Merlot and 2010 Petit Verdot. We spend a lot of time at Pollak enjoying the wines and the ambiance. This visit was the highlight of the day. We closed out the day at one of our favorite vineyards: King Family. This vineyard never disappoints and we were able to sit at a table in front of a roaring fire and enjoy a very nice Viognier while chatting with friends about the vineyards visited during the day and the plans for the rest of the weekend. The wines are drinking very nicely, especially the 2012 Viognier and the 2011 Petit Verdot. The 2011 Seven, port style wine, did not disappoint either. What a beautiful day. As we were departing King Family Vineyards, the colds broke and the sun finally began to shine, Chris took this image which represented the day fairly well--wine and dark skies. Another great visit to the Charlottesville region to sample wines of the Monticello AVA. But like I have written before--the key to enjoying wine is not about the drinking, but about the conversation and the friends which surround the experience. I must be in one of those fun travel periods. Beginning the week enjoying the warmth of Denver, I am now back into the freezing temperatures of the East. It is cold. But, you know that. This morning, I awoke to the sunrise over Charlottesville, Virginia, outside my hotel window and through the glass of the multiple stories high atrium than helps to keep the freezing wind away from my window sash. Yes, for those who know me it can only mean one thing, my return to Charlottesville--a wine weekend to start off the new year. We visited four wineries/vineyards/cellars (funny how even though they are the same they call themselves different things) on our way here yesterday afternoon. I have another few lined up for the travels today. I revisited Pearmund Cellars yesterday and refreshed my remembrance of their wines and some good times that I had with Mom and Dad late last year. What a memorable day that was! Good wines and good wineries seem to get better with age. In addition to revisiting two other wineries, I also checked out a new one, Marterella Vineyards and enjoyed a spectacular Sangiovese and also an awesome view of the setting sun behind a ridge in the distance. Visiting wineries is fun, and I don't just mean drinking wine. The fun comes from conversation with the people I am with and also from meeting new people in the tasting rooms. I am convinced that wine is more about relationships and conversation than it is drinking. Conversation begins with the first scent of the wine and continues through the last sip. The forces of nature smote me! I wrote a couple of days ago about how I was enjoying 60 degree temperatures and snapping images of Pikes Peak while in Colorado while friends and family in the East were suffering through a massive snow storm. I woke up in Denver, Colorado, yesterday morning to single digit temperatures, the thermometer in the car actually recorded -1 during the drive to work, and snow! Yup, snow. The scene out my hotel window reminded me of the scene I imaged while in Alaska during February of last year. AND, it was warmer in Alaska when I took the image. What a terrible thing to do to a guy. Provide enticing warm temperatures one day followed by below zero and snow two days later. I went back into my blog from February and found the Anchorage image. It is scary how similar the scenes look! Snow covered cars and parking lots. The difference of curse is that the snow in Denver will be gone today as the temperatures are supposed to creep close to 60 again. 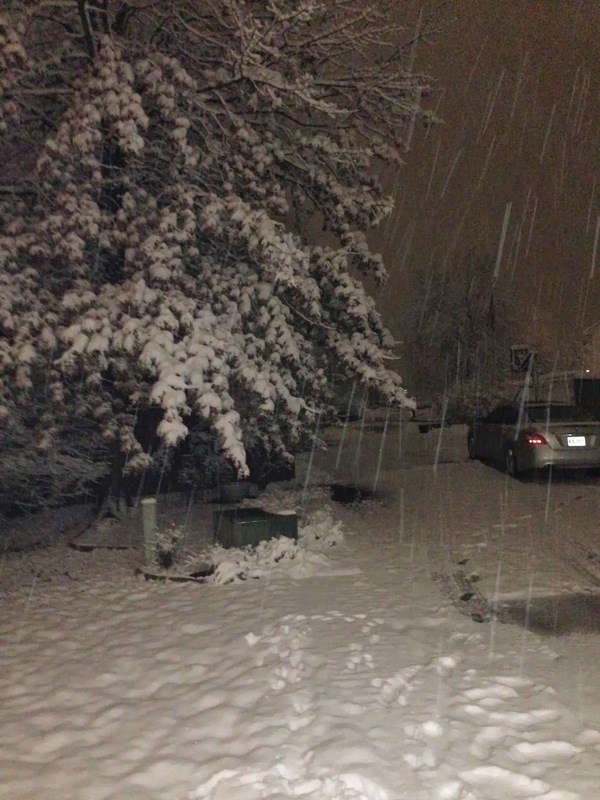 Conversely, I'm not sure the snow ever melted in Anchorage--just kidding. So, I am duly chastised by the forces of nature for writing the inflammatory blog entry about my warm weather while my family and friends were suffering in the cold and snow. I find aircraft intriguing, perhaps that is why I joined the Air Force when I was younger. The other day I ran across a venerable old reconnaissance aircraft on display at the Peterson AFB, Colorado, museum. It is an EC-121T. I have been especially lucky on previous visits the museum to receive a personal tour of the interior of this Cold War warrior. Not on this trip however. This aircraft is impressive and is the largest on display at the museum. She has an impressive history and I even know at least one person who admits to being a crew member on the aircraft. This aircraft is one of only 22 of this model that were built and coincidently, it carried a crew of 22. I took a pretty good image of the information placard to capture at least some of the history. But what about the deeper history of this aircraft and the men who manned the stations in its interior. I enjoy thinking about the missions that this aircraft flew--recovering safely after every one with its precious cargo of brave airmen. They were on the front lines of the Cold War between Russian and the United States. They were also on the front lines of the Viet Nam conflict. I am sure there were some very impressive or even downright scary missions completed by this aircraft and its crew. Although my favorite aircraft of all time are the B-17G and B-52G aircraft, I really appreciate all of the different aircraft I see, and I remember their names and missions. During this trip I had the opportunity to see some other old favorites, an F-102 Delta Dagger and an F-104 Starfighter. Seeing these fighters reminded me of times gone by during the Cold War. I wonder how many missions each of them flew before retiring to be permanent displays stirring the yearning for jet flight in the hearts of little boys and old men? They certainly stirred memories in me. I remembered being a young Second Lieutenant some decades ago and supporting the 49th Fighter Interceptor Squadron equipped with F-106 Delta Darts while at my first duty assignment of Griffiss AFB in upstate NY. They were fast and they were loud. During November 2012, I wrote about a KB-50 refueling aircraft that I ran across during a visit to MacDill AFB, Florida. Another old Cold War warrior on display. I received a really great input form the Tanker Association which provided a lot of additional information about the specific aircraft and how it was one of only two remaining out of 112 which were converted. It is good to pause for a moment and remember. So many men and women have gone before us it is easy to forget the sacrifices they both they and their families made to bring us to where we are today. I was fortunate not to be back East suffering through yet another Nor-Easter blowing up the coast, pounding the land and dropping tens of inches of snow on my family and friends. But, because I was not there I had to work and did not get a free pass for a day off. Which is really OK because I had some important work to do, people to see and people to meet. I did, however, enjoy 60 degree temperatures and awesome blue skies. I enjoyed scenery that included the Front Range behind Denver and an awesome image of Pikes Peak framed by some evergreens outside the restaurant window where I enjoyed some lunch. No, it was not out my hotel window--but it was outside the restaurant. What did you do on MLK Day? It was a holiday for me! And the weather, it was fabulous. I did have to do some preparations for the expected blizzard like arctic conditions coming later today. We went out for snow melt and ensured the car was full of gas. Ready for the onslaught. But, it was an awesome weather day in advance of the storm. So nice, that I took the time to grill dinner and enjoy the moderate (for the season) temperatures, at least for the day. The sun was warm and I was actually outside in a T-shirt and doing alright temperature-wise as long as I was in the sun. There was no snow and the knowledge of the storm on the horizon made the grilling experience that much better. So what did I do on MLK Day? I enjoyed the sunshine and dreamed of summer once again. 1. 2014 is already 20 days old! Wow! It is flying by. 2. It is entertainment awards season with Oscar nominations and Screen Actors Guild awards and so many other awards and shows that it is hard to keep up with it. I wonder if I will watch any of the movies that I haven't seen just because of award nominations. But if I do, there are even recommendations on which films to see. Check out this link for suggestions: Four films to see. 3. I think the news media has declared open season on politicians. 4. The NFL had got to do something about terrible officiating! I was watching the 49ers-Seahawks game and could not believe the number of game changing calls that were missed or botched. 5. Another Arctic cold-wave is headed into the area just to ensure that I am aware that it really is winter and that springtime is still a long way off. 6. Super Bowl. Broncos and Seahawks. 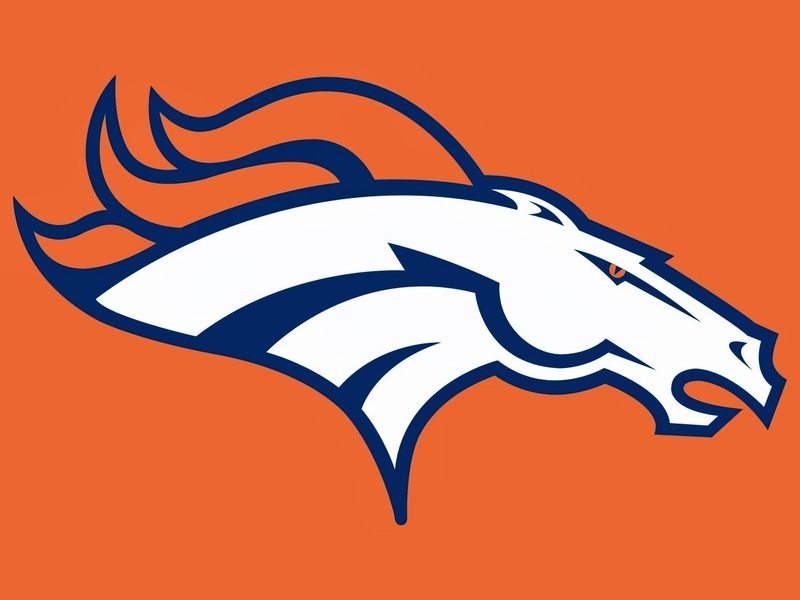 I choose, Broncos! 7. Lately, it seems that the new media is avoiding real news and becoming more of an outlet for network advertising. I could not believe that one whole segment of the Today Show on Saturday was devoted to a new cast member on Saturday Night Live. 8. There is some interesting Super Bowl trivia regarding number 1 seeds. The game between the Broncos and the Seahawks will only be the second Super Bowl between number one seeds since realignment in 2002. The other was between the Colts and the Saints (won by the Saints) during 2009. Only one other number one seed has won the Super Bowl: Patriots during 2003. Number one seeds have on 2 of 11 Super Bowls. This one will make it 3 of 12. What does this mean? The number one seed is the team with the best record, but may not be the best team. The bone chilling cold returned to Maryland and I was greeted with a dusting of snow yesterday as I allowed the dogs to head into the yard for their morning business. I think even they were a bit shocked at the temperature change. And yes, I wrote dogs, plural. We are dog sitting for Ben this weekend and so I have my pair-o-Kees (or two keeshonden) for the weekend. I admit, yesterday proceeded at a much slower pace than some recent Saturdays that I have written about. We two basketball games, but thankfully they were back-to-back which made for a much more efficient use of time while allowing us to focus on each grandson's efforts individually. But the real question soon became--what to do on a cold but sunny Saturday. Why, let's go to the mall of course! And so off we went to the mall--in Annapolis. One of the biggest malls in the area. It turned out that many other people had the same idea--get out of the house but find somewhere warm to spend the day. Their decision, like ours, was to head off to the mall. And it was a good thing we sojourned to the mall because we had one gift card with an approaching expiration date. I bought a new shirt using that gift card and so it wasn't all bad. Today, escaping the cold will be a bit easier because of the football playoffs. They don't start until a bit later than normal--but the games should be exciting. I still dream of being on a hot beach with a cold drink in my hand baking in the Caribbean sun. Now that would be a great Saturday! I decided to explore this word for one more day. It seems that I have moved down the road in my enjoyment of wine into the realm of overcomplexifying. Yup, no longer is it enough for me to just like a wine. Gone are the good old days when I just considered whether I liked the wine or not. Now, whether I like it or not, I am pulling the wine apart and deciding why I like it or what could be improved in the wine to make me like it. Is is balanced? Is there a complex flavor and aroma presentation? How does the wine feel? How are the tannins? The acidity? The minerality? What aromas are present? Currants or grapefruit or flowers or cherries or leather to whatever flavor you can imagine. I tasted a wine once where the winemaker described hints of bubblegum. And I look at how the wine appears in the glass. Is the color good--be it red or white. Does the color go with the kind of grape? I have overcomplexified wine drinking and enjoyment. Even when someone asks what my favorite wine is I find myself unable to give a straight answer? Do you mean for drinking with cheese? Or sitting around the pool on a hot summer afternoon? Or enjoying with pizza, or hamburgers, or salmon, or a hunk of beef? Red or White? It used to be so simple--my favorite wine was an Australian shiraz. But now it comes out something like a 2005 Axios Napa Valley Cabernet Sauvignon Reserve. I can't afford to drink it very often, but it is my favorite. On the other hand depending upon the day, my favorite wine might be an Americana Vineyard Apparition, if I'm in the mood. Perhaps that is why life is all about. We take simple things and overcomplexify them, just to make ourselves feel better. An associate at work came up with the word "overcomplexifying" yesterday to describe the problem solving approach used by some people. I actually found the word "overcomplexify" in the Urban Dictionary. I think the second definition is really funny and too true, but I can't print it in my blog do to some raw language. So click the link and scroll down to the second definition. I think there are four definitions total, but the fourth seemed a bit redundant. Overcomplexifying is actually so true that it is almost funny, if it weren't so tragic. Some people have the gift of being able to take simple concepts and make them impossible to understand. In retrospect, overcomplexified was how I viewed my day yesterday. I am beginning to loathe Thursdays. They are my busiest day of the week. I had meetings at 8, 9, 10, 1030, 11, 12, 1PM and 3 PM. Ugh! I missed the 1030 meeting because I wasn't out of the 1000 meeting yet. Is it Saturday yet? Maybe I can sleep in until 6 AM and get this week out of my head! 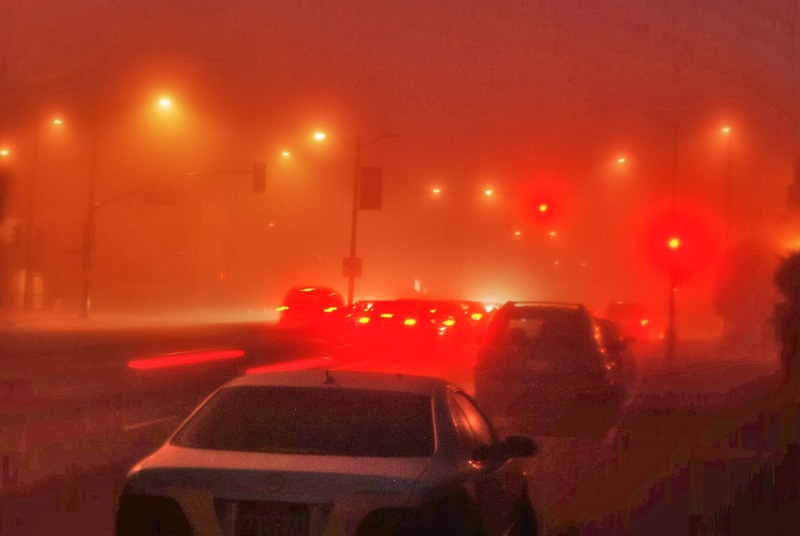 I pulled onto the foggy highway yesterday morning in my pick-up truck and was greeted by three rows of red tail lights stretching into the distance as far as I could see driving at a walkers pace. Traffic was jammed solid. Three lanes across. Trying to survive in the fog. It took an extra fifteen minutes to get to work, but I arrived alive despite the dense fog which was doing a good imitation of the mist in the movie by the same name. The fog slowed the traffic and I am sure contributed to many ulcers among drivers who left too late and didn't account for the expected dense traffic conditions. We have had a lot of fog lately. The changeable weather has contributed to most of it. Cold ground and warm air. Maybe this morning will be better, traffic wise. Less fog and higher speeds. I have been reminded this past week of the value of family. Last evening, we had an unplanned, impromptu dinner with Mom and Dad, Jeremy, Nicole, Lucas and Patrick. It was awesome for us to be together on Mom and Dad's last evening in Maryland before heading off today for Houston to escapee the cold months. Sunday, during the football games, I was able to snap an awesome image of my kids on Dad's lap. Wow. That hasn't happened in a long time. It seems to me that sometimes we spend too much time on other people and forget that families are the most important part of life. Yes, I have great friends, and I love them. I think of most of them as family, too. But our problem is that sometimes we place other people (who are not even friends) and activities before family and friends. Families rock. We just need to spend time together to know that. I remember when it was fairly common practice to put pictures of missing people on milk cartons. I wonder whatever happened to that practice? It seems milk is now delivered in plastic containers that are made up of mostly empty space and there is no place for a picture. It is kind of sad that we have lost touch with milk cartons. And I remember that before milk cartons there were milk bottles. I remember the bottles, both the half gallon size and the smaller ones that we drank milk from during school. They had little paper caps in the tops that with a small tab on them that I never could seem to manage to get off without pushing them down into my whole milk which usually had a layer of cream on top. Mmmm. I was given the small sign in the picture this weekend as a remembrance of the milk carton days. It is really very true--I think there are more wine bottles around than milk cartons these days. Maybe we need to place a picture of a milk carton on a wine bottle. But the truth is, more people of my friends will see a wine bottle than a milk carton. 1. I'm still having some issues remembering that it is 2014. I guess I'm in denial that 2013 ended so abruptly. 2. Birthday celebrations, football celebrations--it was a weekend full of celebrations! Celebrations are a lot better than the alternative! 3. What is cooler than seeing three of his great-grandsons on my Dad's knee? Now if I only could get them to sit still long enough for a picture. 4. People quibble about the strangest things. If they only could step away and look at the big picture. 5. One of the great things about wine is that there is at least one for everyone's unique tastes. 6. I listened to A-Rod's defense and was amazed. It sounded the same as a child's defense when accused of eating cookies from the cookie jar. You didn't catch me in the act, therefore I didn't do it. I'm glad that in the end, he will be nothing more than a sad footnote in baseball history. 7. On the baseball theme, if A-Rod only got effectively a one year suspension for doing something that definitely affected the outcome of baseball games, why is Pete Rose still suspended for life? I Thought Saturday was supposed to be a day off? My work week, which is at least a classic work week, is a Monday to Friday affair. I use my weekends for relaxing and getting a few small projects done around the house, maybe attending a sporting event or a concert, and going to bed late and getting up later. The operative concept is- that weekends are for relaxing. That, friends, is only a concept that does not often apply to real life. Take yesterday as an example. An aggressive schedule for a Saturday. 4:00 PM - Lucas Turns 4 Birthday party! Yay. Great food and fun. Caught a few minutes of the Seahawks-Saints playoff game. 5:45 PM - Race home, change clothes and head out the door. 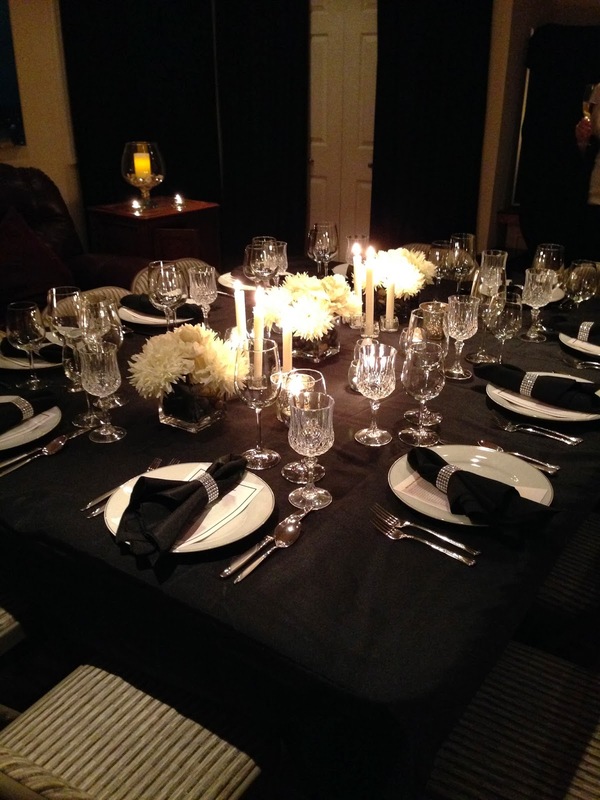 6:30 PM - Wine Club Dinner -- which was awesome!! I can't wait for Monday so I can go back to work. Lol. 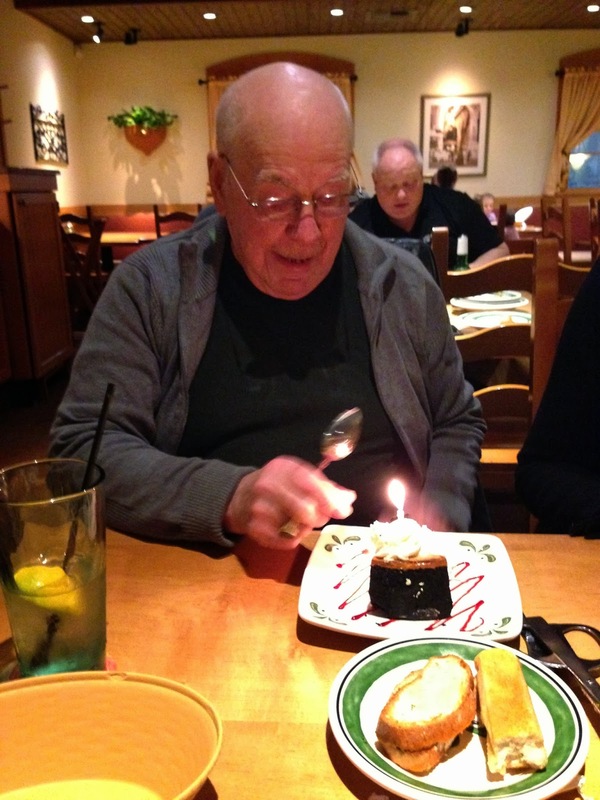 Celebrating 86 years, last evening Mom, Chris and I went out for a celebration dinner of Dad's life and health. Although it was raining and chilly, it did not dampen the spirit of the celebration as we visited a local eatery and engaged in cell phone free conversation and memory making for over two hours. It was interesting to see the restaurant fill up with other diners and then begin to empty as we had chosen the busiest dining hours to enjoy our meal. It was a nice, relaxed paced evening for the four of us to enjoy along with more food than we could eat. The conversation ambled through many topics of the day, but mostly it was aimed at deepening the ties that bind families together as we appreciate each other's points of view on the topics of the day--carefully avoiding the taboo topics of politics and religion. 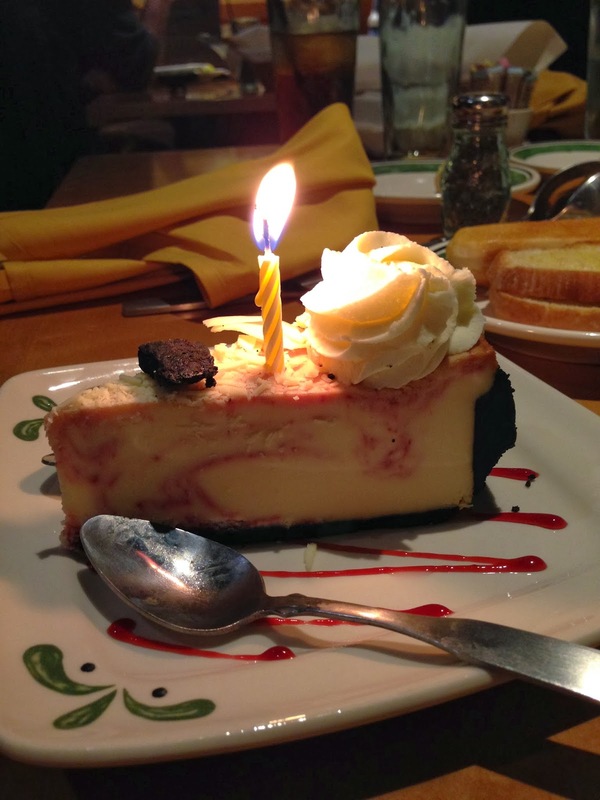 The cheesecake, as it turned out, was the hit of the meal! Even Chris got into the spirit of the evening by helping the birthday boy finish his man-sized portion. I did, yesterday, while sitting in a leadership class. I looked at the ceiling of the classroom and wondered how it could be so abused. Then I looked at the ceiling in my office when I got back to work. I have some ceilings at home that I'm trying to fix--I found out that I am not good at mudding ceilings. It looks pretty bad. Well loved. I checked out some store ceilings. They sometimes don't even exist. No ceiling at all just the roof overhead with a lot of mechanical "stuff" in between. 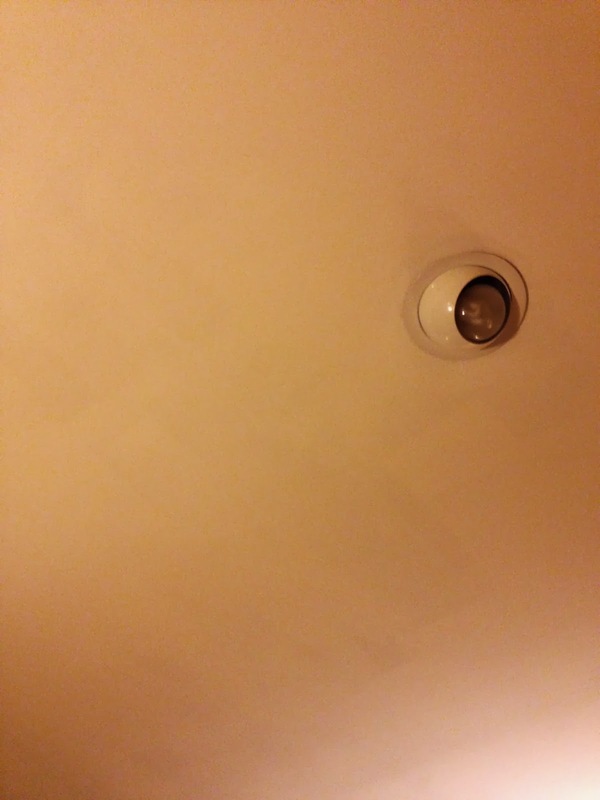 Good ceilings should not be noticed. 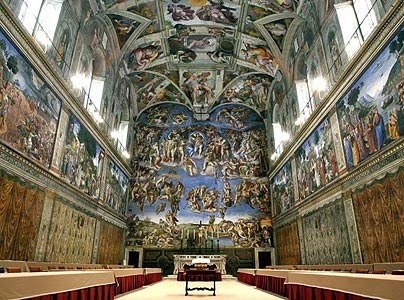 When ceilings become a topic of conversation they are either in poor repair or are something akin to the Sistine Chapel. Take some time and look up. Then, wonder why? With the impending end of the Christmas Season, we decided to retire out Christmas dished for another year the other day. Little did we know that our faithful Riordin, the cat that came back, would immediately discover a different use for the transitional space. Seems that as soon as we removed the Christmas plates he decided to check out the vacant space as new hiding/play area. He seemed quite excited about the prospect of having a secret place off the floor and away from the dog's traffic pattern. Too bad for him! We had other plans for the space and his occupancy was soon terminated. He was no worse for the wear--but we know now that he is searching for a new hideout! 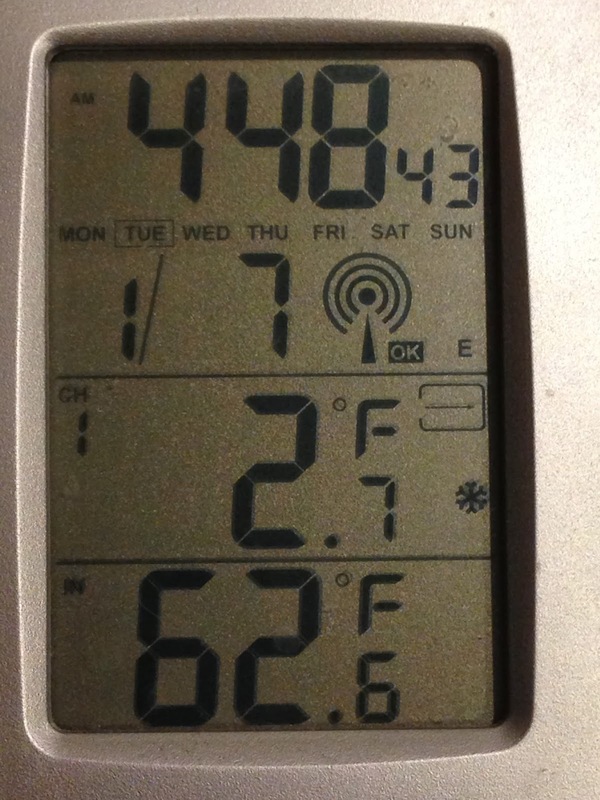 The thermometer at my house recorded 1.8 degrees Fahrenheit at 7:32 AM on 7 January 2014. That is how cold it was. The rain before the cold snap made most of the snow go away and so it is just too cold to think about anything other than how cold it is. It is warmer this morning. It is 7 degrees. Still single digits. I guess it is important to recognize how cold it is so that during the summer I can better enjoy the warmth. It is supposed to be 63 degrees here in Saturday. That is 61 degrees warmer than the coldest I recorded during this cold snap. It will feel like summer. It will feel awesome. I may start up the convertible and take it for an afternoon jaunt, except that it is going to rain. Weather is and there is little we can do except prepare for it. I hope you are surviving the cold and for those of your with livestock and outdoor pets, I hope they survived. I talked to one guy yesterday and he said that all he really could do was to bring the animals into the barn where at least they were out do the wind. I guess sharing the kitchen with a goats or chickens or larger livestock is not an option. It was so cold, I think I saw a polar bear moving in down the street. I noticed something, the more the news media and the weather professionals talked about the record setting cold, the colder I became. It was weird. I was getting cold just hearing people talk about the cold. And it seemed colder outside, too. I thought I could see my breath in the office. I even had to put my sports coat on because I started to get cold and it was still 40 something degrees outside. And then the temperature started to drop. 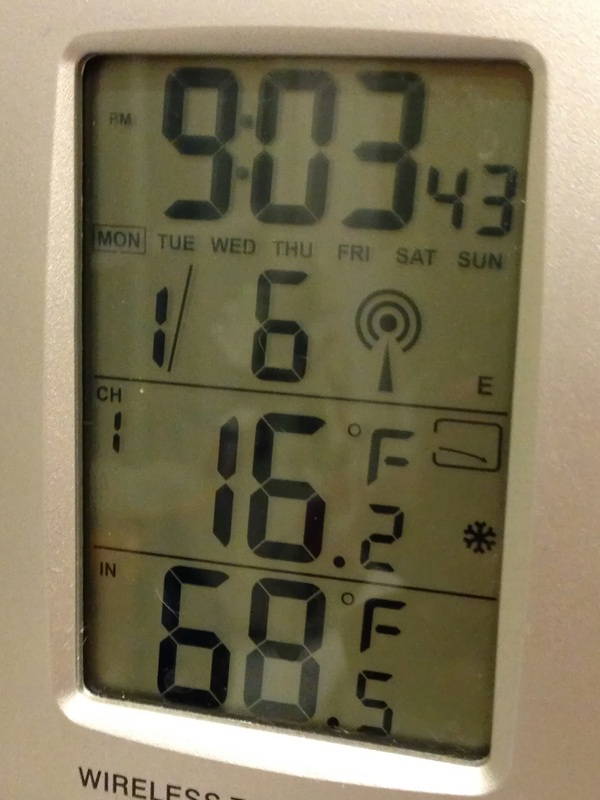 By 9 PM last evening, it was 16 degrees and falling. This morning at 4:48 the temperature reached a frigid 2.7 degrees and probably would continue to fall as dawn was still two hours away. Just more excitement, compliment of Mother Nature. -Some people walked around for days with spoons or forks stuck to their tongues! -Hitchhikers were holding up pictures of thumbs! -Roosters were rushing into Kentucky Fried Chicken and begging to use the pressure cooker! -When I dialed 911, a recorded message said to phone back in the spring! -The optician was giving away free ice scrapers with every new pair of eyeglasses! 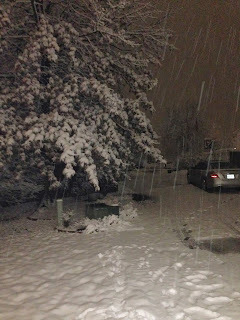 -Kids were using a new excuse to stay up late: "But Mom, my pyjamas haven't thawed out yet!" 1. And it's off--2014 is one week old and already filled with storms and news. 2. The NFL needs to improve its product. Poor officiating and monopolistic marketing have led to a decline in the experience of the NFL. Frankly, it costs way too much to attend a game and the experience isn't all that good--especially with a minus 40 wind chill. 3. Baseball season starts soon and then it will be Spring! 4. Fire in the fireplace, football on TV, is there a better way to spend a Sunday afternoon? Yup, on a warm beach somewhere! 5. Isn't it cool that the Russians and the Chinese had to ask the the US for help in Antarctica with the frozen in the ice ships? 6. The cold weather is coming and I thought it was already here. 7. Atheist churches? Seems that are having a problem deciding what they are going to be about. Read this story from CNN. 8. Bye-Bye Love Phil Everly of the Rock N Roll Everly Brothers died Friday at the age of 74. I can tell that the Christmas season is ended because basketball season has begun. 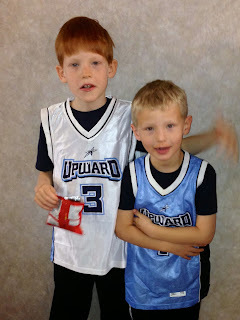 Yesterday was opening day for Ethan and Jackson. Fortunately, both games were at the same time yesterday--which makes it a bit difficult to watch--especially when they are on the court at the same time as they were during the first half. At least the courts are next to each other. Their teams have been practicing since early December. Ethan participated in this league during the past few seasons, so we know the ropes. 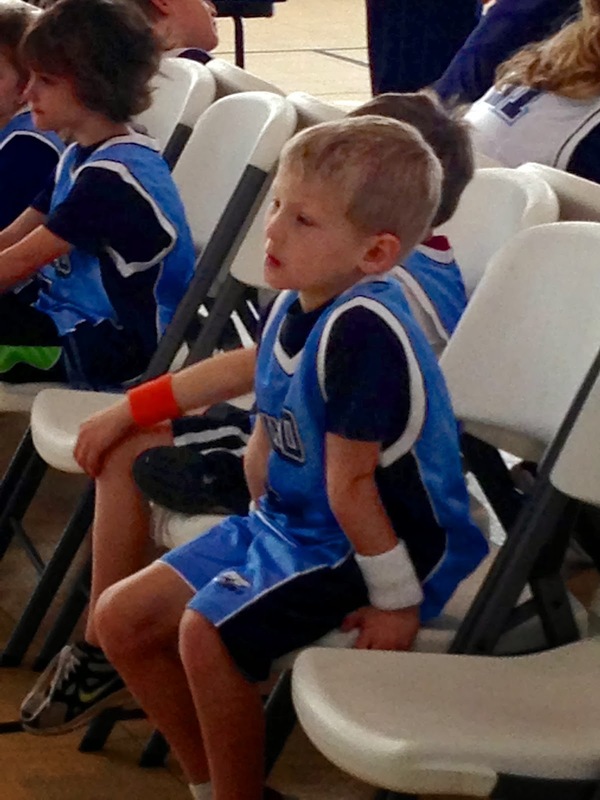 This was Jackson's first foray into basketball. 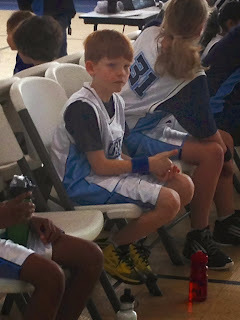 He has been playing soccer and most recently flag football--now for something different it is hoops! On an all too cold Saturday we entered out to enjoy sports in ins purest form, where winning isn't the only thing that matters, to abuse a quote from Vince Lombardi. And, to document opening day, I made a video, too. The greatest moments of opening day. Enjoy the games. I did. What a mess the roads were as I ventured to work yesterday. Were they upstate NY messy? No. But, they were far more dangerous. In my short commute to work I had to take decisive defensive action on two occasions to avoid fairly serious potential accidents. Drivers making sudden lane changes or merges seemingly unaware of the traffic around them. 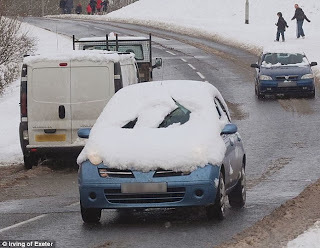 They had failed to clear their cars of the snow and were trying to get to their destination without being able to properly see those around them. In this case, that was me! The roads were actually fine--wet or even dry. It was the other drivers who were causing the danger to travel. Beware and be careful. Clear windows and mirrors! Well it is clear that 2014 wants to make its mark on us right from the beginning. A huge storm is sweeping up the east coast causing delays and school closings from Washington DC to Boston and beyond. It is only Day 3 of the year! I wonder what else is in store. I already have to brave the coldest temperatures of the season--16 degrees as I write this and still falling, and shovel the driveway. Ugh. There is a fire roaring in the fireplace adding its warmth to supplement the heating system and providing that ambiance along with the still lighted Christmas Tree. I'm very happy that there we are having a delayed opening and that I can enjoy the fire inside the warm inside the house. Welcome 2014--let's try to do a little better as the year goes on. Every Christmas NORAD, the North American Air Defense Command headquartered in Colorado Springs, Colorado, tracks Santa on his flight around the planet on Christmas Eve. 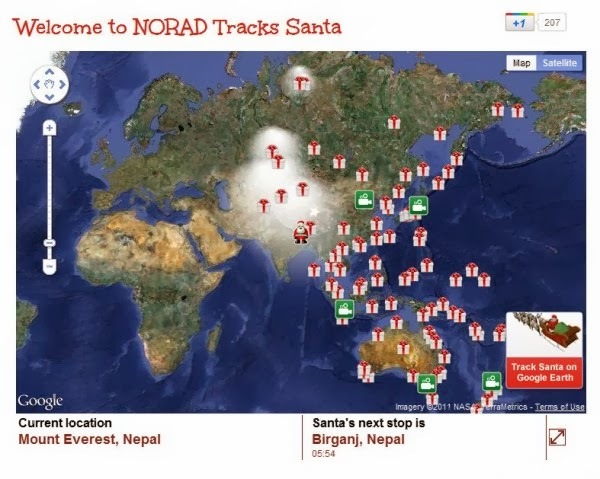 I, myself, had logged onto their site to track the big guy's progress. How did this all get started? I never really thought about it, but this year the answer became clear while reading an article in a Federal Employees publication. The North American Aerospace Defense Command — or NORAD — first began tracking Santa's sleigh on Christmas Eve by mistake. In 1955, Sears placed a newspaper ad that encouraged children to Santa's private phone line to chat with the jolly old elf. The only problem? The ad contained a typo that instead led to the private for NORAD's predecessor, the Continental Air Defense Command (CONAD). When Col. Harry Shoup, the officer on duty began receiving calls from curious kiddies, he decided to play along. And so, it appears, a DoD agency began tracking Santa because of a mistake. I noticed last night while celebrating the new year's arrival with friends and drink, kissing, watching the ball fall, and fireworks; that it arrives with a sense of hope that it will be better than the year just departed. I have to be honest though, last year was a good year for me. Sure, there were some definite low points and I don't want to dwell on them, but overall the year was a pretty good one for me and for my family. If I measure the year by things, there were a lot of good and new things for not only myself--but my immediate family too. New places to live, new vehicles, new stuff of all kinds. But the measure of success should not be in the things--it should be in the quality of the relationships. Last year was also good in terms of relationships, but there are some that do require a bit of work. I've let some relationships run along on autopilot and they need a touch of personal intervention. Therefore, most of my resolutions revolve around improving the quality of my relationships with family and friends during 2014. One resolution that I am making, however, is that when 2015 dawns I would like to do it aboard a cruise ship in the Bahamas! We will see how that one works out. Palm trees and warm breezes as far more preferable to cold winds and leafless trees. 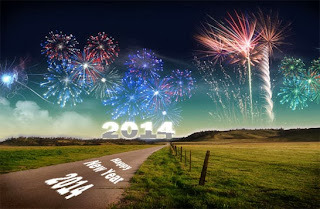 Welcome 2014 and may this year be the best year ever, not only for me but for all who dare to dream.